A storm moving through the region Sunday into Monday is expected to bring rain, but not as much as earlier forecasts indicated was possible. Even so, the National Weather Service in Gray has issued a flood watch for central Maine from 8 a.m. Monday to 8 a.m. Tuesday and recommends that people living in flood-prone areas be prepared to take action if flooding develops. Derek Schroeter, meteorologist with the National Weather Service in Gray, said some showers were popping up across the region Sunday afternoon, but little of the rain was reaching the ground. Sunday night into Monday, scattered moderate showers and pockets of steady rain were forecast to bring between 3/4 to 1 inch of rain to the region. Forecasters had been watching the track of the storm developing last week off the Gulf Coast of Texas. It was expected to move directly over Maine, bringing heavier amounts of rainfall, 1 to 2 inches. At the end of last week, Nick Statulis, data section chief with the U.S. Geological Survey’s Augusta office, said with the warmer temperature over the weekend and the anticipated rainfall, rivers in the state were expected to rise. The other factor that could contribute to flooding is the depth and state of the snow pack in northern and western Maine. “We do have quite a bit of snow left in the mountains and it is ripe,” Tom Hawley, hydrologist with the National Weather Service in Gray, said via email at the end of last week. When a snow pack is ripe, it doesn’t have much ability to retain rainfall, and it’s ready to release water, Statulis said. Every year at this time, the Maine Cooperative Snow Survey regularly measures how deep the snow is across the state, as well as the water content of the snow pack and how that compares to other years for the Maine River Flow Advisory Commission, made up of representatives of eight major river basin management operations, seven state agencies, two federal agencies and the University of Maine. The data is available to both emergency action agencies and the public. Statulis said, in the most recent survey, there was still more than 10 inches of water in the snow pack in the headwaters of the state’s major river systems. As of Sunday afternoon, the Advanced Hydrologic Prediction Service of the National Weather Service showed that the Kennebec River could reach the action stage Monday night, and may reach the minor flooding stage by Tuesday. 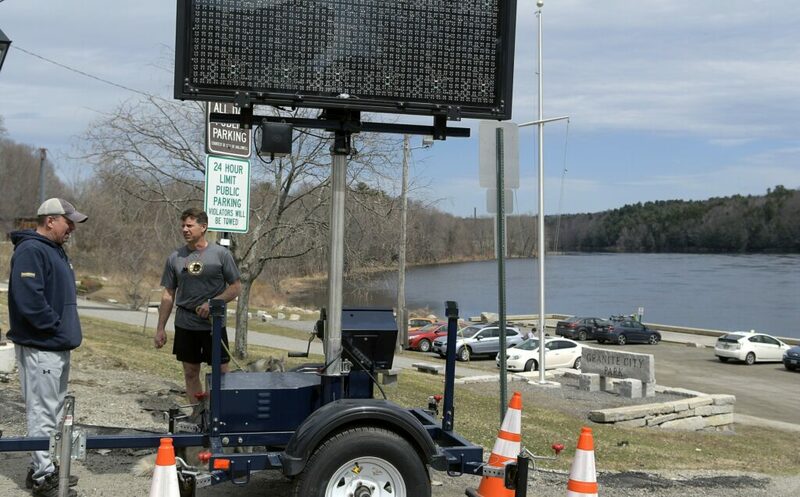 On Sunday, electronic signs were deployed near the waterfronts of Hallowell and Augusta to be able to warn residents and visitors of changing river conditions. A second storm was predicted for later this week. Schroeter said, like the first storm, the one expected to arrive late Thursday or early Friday is forecast to take a path along the Great Lakes and bring less rain that initially predicted to Maine. This week, daytime temperatures in central Maine are expected to fluctuate between the 40s and 60s, Schroeter said, with cooler temperatures in the mountains.